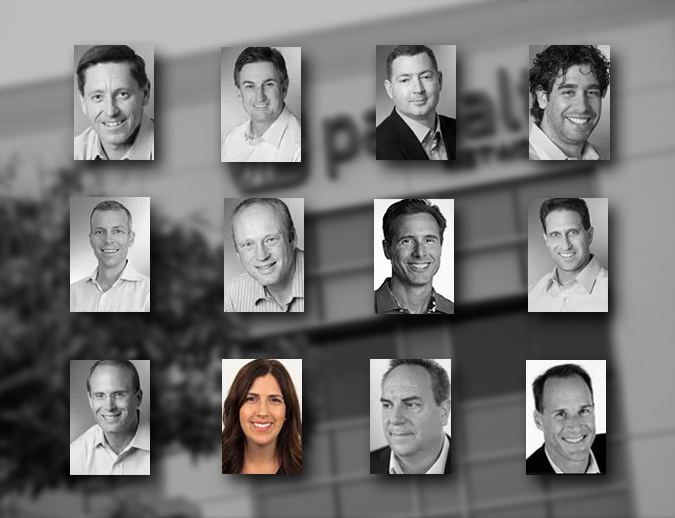 According to its website, this is the management team of cybersecurity company Palo Alto Networks. The firm’s board of directors says it has diversity issues under control, but a majority of shareholders voted for a resolution saying the company should release its workforce data on race and gender. The company still refused, after counting abstentions as no votes. Palo Alto Networks has so little diversity among top executives that its CEO and president are both white men named Mark. The cybersecurity company’s management team has 11 men and one woman – the head of human resources – with no apparent racial diversity. The company’s board of directors says it has diversity under control but it is opposing an upcoming shareholder resolution calling on the company to share its workplace demographics and diversity initiatives. The board, which oversees the management team, has its own diversity challenge. It is made up of 10 men and one woman, who was added last year after another shareholder resolution pressured the company to increase board diversity. The company didn’t respond to repeated requests for comment. The disclosure proposal for Palo Alto Networks, coming to a vote Dec. 8, is one of several this year targeting Silicon Valley tech companies for their lack of diversity and transparency. The resolutions – which stockholders vote on at annual meetings – call on companies to release the race, gender and job category breakdowns of their workforce as way of forcing corporate leaders to focus on diversity. The diversity numbers reside on a one-page form, called an EEO-1 report, that all companies with 100 or more employees must file annually with the federal government. After years of pressure, tech industry leaders such as Google, Facebook and Apple make their forms public each year. Yet Reveal from The Center for Investigative Reporting found that most Silicon Valley firms refuse to disclose their EEO-1 statistics, despite many assuring the public that diversity is an important priority. Out of 211 tech companies surveyed by Reveal, only 23 released their EEO-1 reports. The shareholder resolutions have also been met with resistance. Lam indicated that the numbers could look so bad they would make recruiting harder: “Disclosure of such information could hinder our efforts to attract, engage, retain and promote diverse employment candidates and employees if it is misconstrued, including by such candidates and employees,” its opposition statement said. The executive team of the semiconductor equipment supplier is made up of eight men and one woman, who serves as chief legal officer and secretary. Lam’s social responsibility report insists the company is “committed to fostering diversity” but instead of a race and gender breakdown, it provides the percentage of new hires who were veterans or college graduates. Lam didn’t respond to Reveal’s inquiries. But not all tech companies try to block the transparency proposals. Last year, Adobe Systems and Citrix Systems faced similar resolutions from Trillium Asset Management, a Boston-based firm that manages investments for wealthy people and foundations with a focus on advocating for social change. Trillium files shareholder resolutions based on where it has investments and which companies it sees as lagging behind their peers. Both Adobe and Citrix responded by agreeing to release their EEO-1 reports, so Trillium withdrew the resolutions. That’s why Trillium’s Susan Baker was surprised at the pushback from Palo Alto Networks. The company had agreed to seek out a diverse set of candidates for its then-all-male board in response to Trillium’s 2015 proposal. But this year, it didn’t want to release workplace demographics or describe policies for increasing diversity. The company did put up a webpage noting that it has networking groups for women and veterans. Shareholder resolutions on diversity data go back decades, and grew in popularity after a 1995 federal commission on the glass ceiling recommended public disclosure as a tool to break barriers, Baker said. Activist shareholders zeroed in on the tech industry, she said, influenced in part by the Rev. Jesse Jackson Sr.’s 2014 campaign to demand more transparency about diversity from Silicon Valley. New York City Comptroller Scott Stringer, custodian of the city’s pension funds, had been focused on getting the financial industry to disclose demographics. But in the past year, the Big Apple turned its attention to Silicon Valley, aiming EEO-1 disclosure resolutions at Lam Research, Gilead Sciences, NetApp and Juniper Networks. “Without these disclosures, investors have no way to assess the ability of companies to retain and promote diverse candidates, how individual companies compare to their peers, or how they have improved over time,” Stringer said in a statement to Reveal. Gilead Sciences agreed to provide some of its numbers in exchange for the comptroller’s office withdrawing the resolution. NetApp also increased its transparency, but not enough to satisfy the comptroller, according to Stringer’s office. In the face of company opposition, the NetApp resolution lost in September, with just over 27 percent of shareholders voting yes. The Juniper Networks proposal failed in May, with about a quarter of shareholders in favor. That’s still considered substantial support by advocacy-oriented investors, who often come back with similar resolutions to force the issue and pressure companies to eventually give in. Tech companies argue that the numbers they report to the government are based on generic job categories that don’t capture the true composition of their workforce. Shareholder groups counter that the firms are free to provide additional data to complement their EEO-1 reports. Diversity proposals need to go much further than basic disclosure, argues Pat Miguel Tomaino, associate director of socially responsible investing at Boston-based Zevin Asset Management. This year, the investment firm filed shareholder resolutions to make Apple, Alphabet – Google’s parent company – and Amazon consider tying executive compensation to diversity. Intel and Microsoft already do that. But Apple responded by trying to prevent the resolution from coming to a vote next year. Data reporter Sinduja Rangarajan contributed to this story. This story was edited by Ziva Branstetter and copy edited by Nadia Wynter.